I would like to have a contacting information of Mr. Gautam including his phone number if possible so that I can contact him personally and plan my journey. You can contact me via email if that is easy and safe for you. I am not sure whether or not I will be able to access this website again. My email id is psridhar@rediffmail.com , can you please send me material regarding Gauri Shankar Peetham? Thank you for the article and the clear description. It will be of great help to us when we undertake our trek to Babaji’s cave in the near future, provided Babaji permits us to do so. Who exactly is this Babaji you have mentioned staying at Mukteshwar? Is that Mahavatar babaji you mentioned there ? Swami Sangsudhyanand Puri also known as “Lal Baba” is living there in Mukteshwar Shiv Temple, Dhuni Kutir. One of his devotee believes that he is Mahavatar Baba Ji. He also wrote a book on Mahavatar Baba Ji. His name is Rambare Mukhey, and he’s a Marathi. He also performs Guru Pooja every year in Mukteshwar Temple, believing that Baba Ji is Mahavatar Baba. Please do send me the matrial . 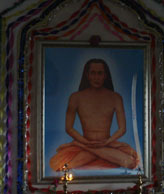 Thank you for letting me know about the Mahavtar Babaji. Do you know the address of Mukteshwar Shiv Temple and/or Dhuni Kutir. I am not in India at present and it would be helpful to have proper address so that I can search and find out my way. Thank you very much. 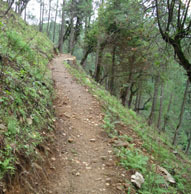 Mukteshwar is a small town in the District Nainital, and also one of the highest peak in the whole District. The Indian Veterinary Research Institute (IVRI), dedicated to livestock research and development was established in Mukteshwar in 1893. The temple is situated in the topmost point of the mountain. 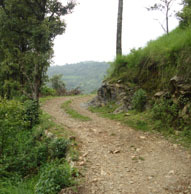 The route to Mukteshwar from Delhi is as follows: Delhi-Haldwani-Bhowali-Mukteshwar. 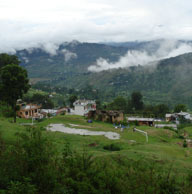 Mukteshwar is about 70kms from Haldwani. Haldwani is a major city in the whole district, also known as the Gateway of Kumaon. Regular bus and taxi services are available from Haldwani to Mukteshwar. Several hotels/resorts/rest houses of KMVN (Kumaon Mandal Vikas Nigam) are available here in Mukteshwar. KMVNâ€™s Tourist Rest House is nearest to the temple. Mukteshwar is located at 29.4722Â°N 79.6479Â°E. It has an average elevation of 2,171 metres (7,123 feet). Mukteshwar is rich in scenic beauty, with magnificent views of the Indian Himalayas including India’s second-highest peak, Nanda Devi. Mukteshwar is a town and tourist destination in the Nainital district of Uttarakhand, India. It sits high in the Kumaon Hills at an altitude of 2286 meters (7500 feet), 51 km from Nainital, 72 km from Haldwani, and 395 km from Delhi. Mukteshwar gets its name from an 350-year-old temple to Shiva, known as Mukteshwar Dham, situated atop the highest point in the town, within the IVRI campus, and close to which lie the overhanging cliffs, locally known as Chauli-ki-Jali, used for rock climbing and rappelling, with an excellent view of the valleys below. The sunrise point is at the government-run PWD Guest House. One can also visit the Indian Veterinary Research Institute. IVRI hostels and the PWD resthouse were the prominent shelters for ages. Now, KMVN operates a Tourist Rest house (can be booked from Delhi as well as on Phone / Wireless from other KMVN guest houses). Several other hotels, resorts, guest houses and seasonal tent / hut based camps come up. Valley Unwind Resort is one of the best resort for various eco-tour activities around the valley. Nice scenery can be viewed from Chaulli ki Jaali, where rocks jut out from the hill face at a bizarre angle. This is a great place to observe eagles and other feathered scavengers as they swoop down at their prey. 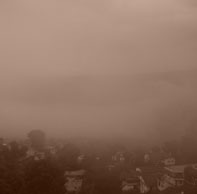 IVRI laboratories (experiments on tiny rats, gold plated books, cattle-sheds), 16 mile x 14 mile wide Deodar forest, prestine 22 snow-peaks view, advanture of living among wildlife like tigers and bears, are some of the major attractions of this sleepy town. 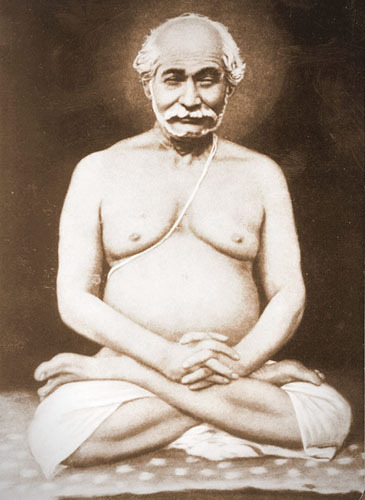 Mukteshwar is ABODE OF A SAINT – SHRI MUKTESHWAR MAHARAJ JI – who lived at the Top Cottage Temple where his samadhi is situated. One of his disciple – Swami Sanshudhanand ji – now stays there. Whole temple complex is a Tapovan, and an ideal place for meditation. Till 1893 the place was known for its shrines and temple before it was selected for serum production to protect animals from cattle plague. Later it was developed into the Indian Veterinary Research Institute (IVRI), which later moved its headquarters to Izatnagar. 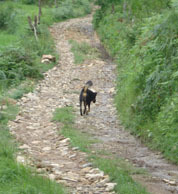 Still Mukteshwar serves as the hill campus of IVRI, including various facilities such as an experimental goat farm. The noted nobel winner scientist Robert Koch visited this place on request of then GOI. The microscope used by him and other historical articles are kept in the museum maintained by IVRI. Hill carved cold room in 1900 is a place of attraction for visitors. It was made to store biological materials then.Because of the hilly topography, agriculture in the area consists chiefly of potato fields and fruit orchards on terraces cut into the hillsides. Robert Koch visited IVRI Mukteswar to work on cattle plague. Haldwani is well connected to the capital Delhi via road and air. The nearest airport is Pantnagar airport with connecting flights to Delhi. The railway station is Haldwani Railway Station with four trains running per day to delhi. Thank you very much Ghanshyam Pant for detail information about Mukteshwar. I will appreciate if you can be contacted via phone and willing to provide your phone number if located in USA so that I can discuss more about the trip I can plan. I highly appreciated your time for providing this details. Have a wonderful day. i am willing to remain at HIS Holy Charan for the rest of my life….and beyond till eternity…………. First of all, I am grateful to you for an excellent account of your visit to Mahavatar’s cave. I shall make an attempt to visit the cave on 5th June. Bought ticket to Kathgodam on 4th night. I have some questions for you. Can you please answer them? 1. Is it the right time for the visit? Hope the rainy season doesn’t start by then. 2. How many days can I stay at the Babaji Smriti Sadan? Is any booking required? If yes, from where and how? If I get accommodation there for 2-3 days, I shall plan my return journey to Delhi accordingly. 3. Are any woolen clothes required at that time? 4. Is that 2-km car ride arranged by Joshiji still possible? In that case trekking will be less. 5. How difficult is the trekking? 6. Planning to book a car from Kathgodam. Is it OK? What kind of car is the best? A jeep? My email id is mbiswa61@gmail.com. If you provide your ph no there, I may call you to discuss. 1) Rains begin in July, so you should be fine. 6) Just take any decent car from Kathgodam. Highway is more or less good. Thanks for your quick reply. Is Joshiji’s ph no. 094113-18540? Can you please confirm? This message is from an older Gautam (62 years) to a younger one. I loved reading your post on the immortal saints of India. I live in Northern Virginia and work as a Lead Economist at Global Financial Integrity (a think tank) in Washington DC. I was initiated in the Sri Vidya tradition by Guruji (Sri Swami Rama) in May 1988 and have, as far back I can remember, an avid reader of Indian spiritual traditions and biographies of Indian spiritual Masters. So naturally I loved reading your post. I am currently reading a book on Neem Karoli Baba; Guruji devotes an entire chapter to Him in Living with the Himalayan Masters. Keep up the great work. You write well and we would love to read about your spiritual “tirthas” and experiences. Om Guravey Namaha! An update to my article. 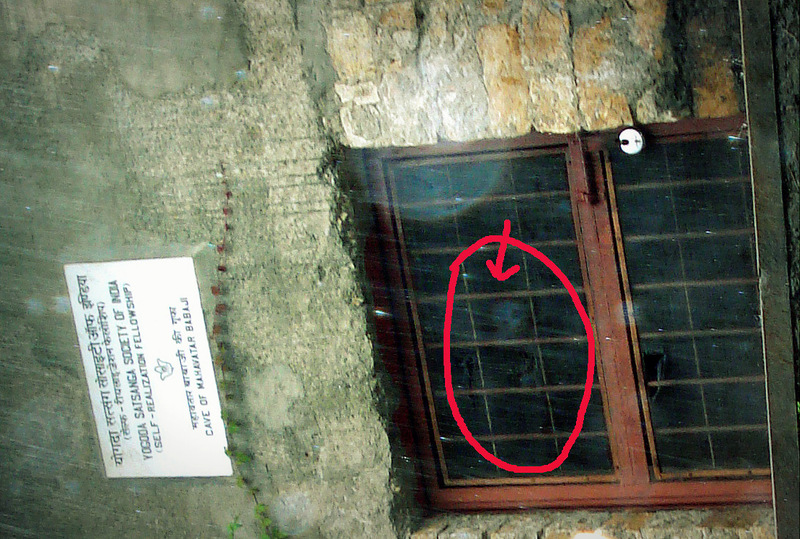 Yesterday my Mamaji (Uncle) and I discovered a strange face in a photo I took back in July 2009 when I visited the Gufa. There is a clear image behind the entrance that appears to be a mendicant with piercing eyes. I took this photo after we had been inside the cave and had locked it on our way back down. Here is the image. Save the image and then open with about 200% zoom. P.S. The fuzziness in the pic is due to drizzle/rain droplets. Can anyone suggest me any ashram near Babaji cave as I need to stay there for couple of days.Or any other alternate for staying near Babaji cave. 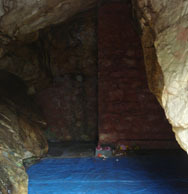 The book of Shri M & your elaborate story of visiting Babaji’s cave inspired me to visit Kukuchina recently. From Bhubaneswar to Delhi to Kathgodam – Ranikhet- Dwarahat & Kukuchina finally. Of course it is a tough trek, but we could make it in May 22 this year. Yogoda society is now constructing pathway up to the cave by putting stones. What a place indeed- calm quite & beautiful nature. Meditation in the cave was very satisfying. The re is no need to get the keys from Smruti Mandir now a days as the Society is keeping it open from Morning to evening. Incidentally a black dog also showed us the way up to Joshi restaurant, when we missed the track. From there we set our journey up to Karnaparayag- Joshimath & Badrinath & finally Kedarnath. Please do continue to write about your spiritual experiences .